The international community struggles to end civil wars. How can international organizations help? At the recent Kuwait International Conference on Reconstruction of Iraq, countries and international organizations pledged US$30 billion to reconstruct Iraq after years of war. This number fell short of the US$80 billion estimated necessary by the Iraqi government as needed to rebuild the country. Iraq is only one example of the lasting damages caused by civil wars. Yet, international responses often seem more concerted after civil wars have ended, rather than during their initial phases. Other current wars illustrate this unfortunate pattern. As of March 2018, the civil war in Syria has likely claimed over 500,000 lives and created severe and lasting damages to public health systems. Yemen has entered another year of large-scale violence, with little prospect for quick resolution, as a recent report documents. Violent armed conflicts elsewhere in the world have equally devastating consequences. Despite these dramatic developments, the international community faces a massive challenge of how to respond to emerging political violence in a decisive and effective manner. Ample research documents the difficulties of ending violence once it starts. The UN engages in preventive diplomacy in some cases, but not in all violent conflicts. There is also evidence that UN peacekeepers can reduce casualties both among civilians and on the battlefield and can also reduce the risk of civil wars recurring once they have ended. Yet, new research suggests that the duration of civil wars has increased, with considerable human cost. Slow and ambiguous international responses to political violence have emboldened governments and rebels to use force to push for their demands. A lack of lasting engagement by external actors is often part of the explanation for why these conflicts continue to rage. There are reasons for a more optimistic view of how the international community can help prevent civil wars in the first place, though. A specific subset of intergovernmental organizations (IGOs) that has the capacity and self-interest to engage in member states in a way that directly addresses commitment problems in pre-civil war bargaining. These highly structured IGOs include institutions such as the World Bank, Inter-American Development Bank, or the Economic Community of West African States. As multilateral bodies, these organizations have clearly defined, and often economic, mandates. While mediating political disputes lies beyond their mandates, civil wars in member countries would impede these organizations’ ability to carry out their tasks. This functional self-interest gives these organizations a powerful tool to establish incentives to avoid political violence in member countries. This leverage of highly structured IGOs in member countries has a notable influence on the costs and benefits that governments and rebels face in early phases of political unrest and violence, before civil wars escalate. When highly structured IGOs are engaged in a country, both governments and rebels can expect clear costs from escalating violence: it will lead to a disengagement of highly structured IGOs and withdrawal of their staff, resources, and other benefits. Yet, highly structured IGOs also carry the promise of rewards for keeping the peace by providing substantial resources and benefits conditional on the absence of further violence. Conflicts in countries with more connections to highly structured IGOs faced a considerably lower risk of escalation. This puts highly structured IGOs into a unique position to credibly condition benefits on conflict prevention. Their self-interest in successful institutional performance requires them to avoid engagement in contexts of high fragility and violence. This means that when highly structured IGOs are engaged in a country, governments and rebels in pre-civil war bargaining are acutely aware of the high material costs of violence. In turn, this provides a crucial commitment device to settle conflicts before they escalate. The evidence suggests that the engagement of highly structured IGOs in member countries is associated with a substantial decline of the risk that political conflicts escalate to civil wars. Since World War II, roughly one-third of more than 260 separate low-level armed conflicts have escalated to civil war. But conflicts in countries with more connections to highly structured IGOs faced a considerably lower risk of escalation, reduced by up to a half. Representative of these broader trends, the history of East Timor illustrates how international organizations can successfully incentivize conflict parties to negotiate and resolve political disputes before they escalate. In Indonesia, a crisis originated when the East Timorese opposition demanded independence in the late 1990s. After an initially violent response of the Indonesian government, highly structured IGOs, most notably the International Monetary Fund (IMF) and World Bank, threatened and imposed sanctions on the regime. The regime responded by yielding to the pressure from these IGOs and calls for East Timor’s independence. Both sides reached a settlement and avoided a full-scale civil war. As promised, highly structured IGOs then resumed old and begun new programs. Both Indonesia and East Timor have since made notable economic improvements, partially helped by resources coming from highly structured IGOs. As a counterexample, highly structured IGOs did not have much leverage to set similar incentives for the conflict parties in Syria in 2011. In this case, the Syrian government was comparatively isolated from the international community, including highly structured IGOs. Without their leverage, there was little the international community could do to effectively curtail the government’s response to the opposition. Instead, the regime went on a major offensive. Seeing this, the opposition turned to defending itself and grew into a rebel force. Without much influence to resolve commitment problems, other international efforts to mediate and end the civil war have failed. Studying the role of highly structured IGOs and the incentives they bring to political disputes in member states suggests one way through which international organizations can help limit the dramatic costs of violent conflicts, such as those in Syria and Yemen. Similar IGOs also can play a role in helping resolve disputes between countries. These IGOs have increasingly emphasized concerns about the detrimental impact of violence on their missions, as the examples of the World Bank, Inter-American Development Bank, and the Economic Community of West African States show. Coordinating these efforts may provide the international community with an additional effective conflict resolution tool. Featured image credit: United Nations by xlibber. CC-BY-2.0 via Flickr. Johannes Karreth is Assistant Professor of Politics and International Relations at Ursinus College. Jaroslav Tir is Professor of Political Science at the University of Colorado Boulder. 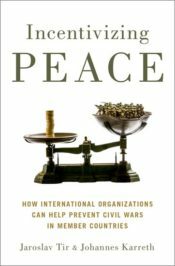 They are the authors of Incentivizing Peace: How International Organizations Can Help Prevent Civil Wars in Member Countries.